You really want a bespoke kitchen made from solid wood. No chipboard or MDF here – simply solid wood, hand crafted into something that will make you smile every time you see it. There is simply nothing to beat the flowing curves, the detailing and the touch of solid wood. No limits on look and feel –– lightly sanded & oiled for that natural rustic look or smoother with a white / cream or coloured wash or even assembled and then hand painted in your own home. We are proud to say we are the Exclusive and Sole distributor of Bespoke Kitchens from Fairlie Furniture Ltd. 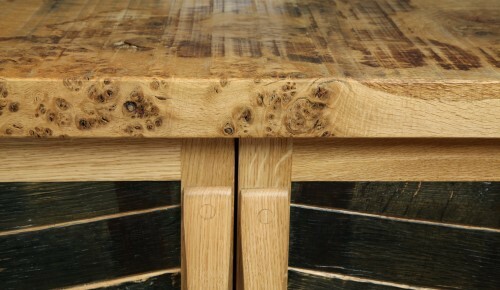 They are one of Scotland finest furniture design companies and can turn your ideas into reality. Kenny, the lead designer and master craftsman, designs distinctive pieces to best realise the beauty of the wood. He has established himself as a leading Scottish furniture designer and his work has featured in numerous interior design magazines and journals. ...... and watch it being transformed. This handmade solid elm table is custom built to order. 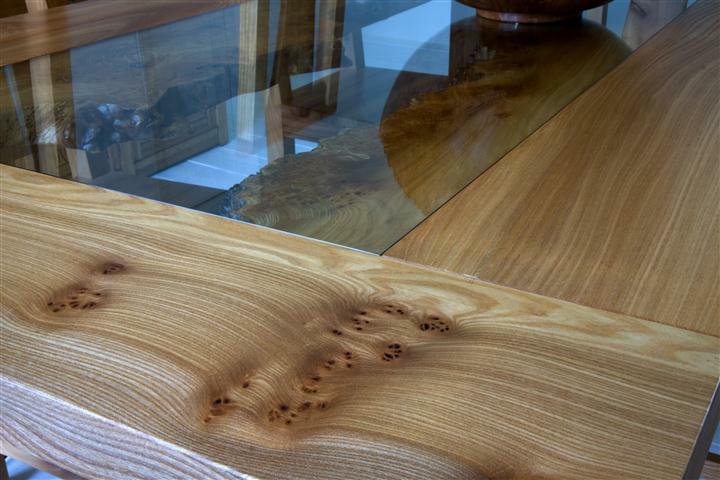 It features crisp, clean and modern edges married with the wildest pieces of natural edged elm featuring burrs and character, which are visible beneath glass table top. 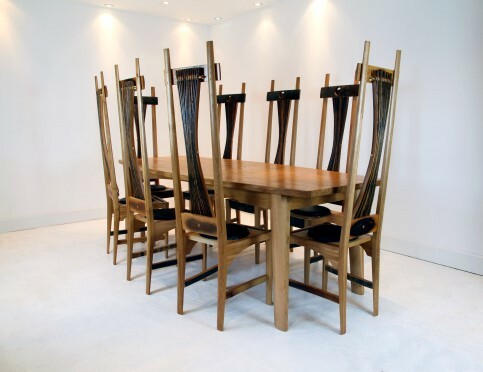 The chairs are high backed with elegant proportions, with burr elm in the back panel and smooth, sweeping lines. The frame is specially constructed so the toughened glass panel drops in and stays flush with the frame. Built to order to match a burr elm dining room table which had previously been purchased by a customer - The moral of the story being that when you are ordering bespoke furniture you don't have to get it all built in one go. One of the challenges for the team was to try and colour match the wood as closely as possible. This is true when you are building a larger piece of furniture as well as when you are building multiple items for the same room at different times. Elm comes in a variety of different shades - in this case the wood used is a very deep, rich brown colour. The customer selected the fittings in this case, they are brass and reset into the drawers and cabinet doors. As with all our custom built furniture, we use the very best quality soft close sliders for the drawers.